Thanks to those who made it out to see our first outdoor art projection on One Greenway With/Without Water. This projection was done as a part of our ANCHOR initiatives. Chinatowns across America are disappearing. Families who have lived in Chinatown for generations can no longer afford the higher rents and costs of living in the area. These changes transform the Chinatown community until neighborhoods become unrecognizable. Like an eroding seashore, the "shores" or borders of Chinatown are most vulnerable to erosion. For over 30 years ACDC has been stabilizing Boston's Chinatown by building affordable housing and promoting community self-determination through arts, culture and activism. In the 2010 Chinatown Master Plan, the community highlighted "anchor areas" - landmarks dedicated to preserving Chinatown residents, businesses, and cultural institutions. Together, ACDC's ANCHOR projects serve to influence the fate of some of the most valuable land in the city. Through our projects, we want to remind residents and visitors that Chinatown is a place of live, work, and play. Each letter in ANCHOR represents a characteristic that describes our Anchor projects. We look for spaces that are unused or underused and activate them, so that residents can enjoy the space and imagine the possibilities that the space could be. 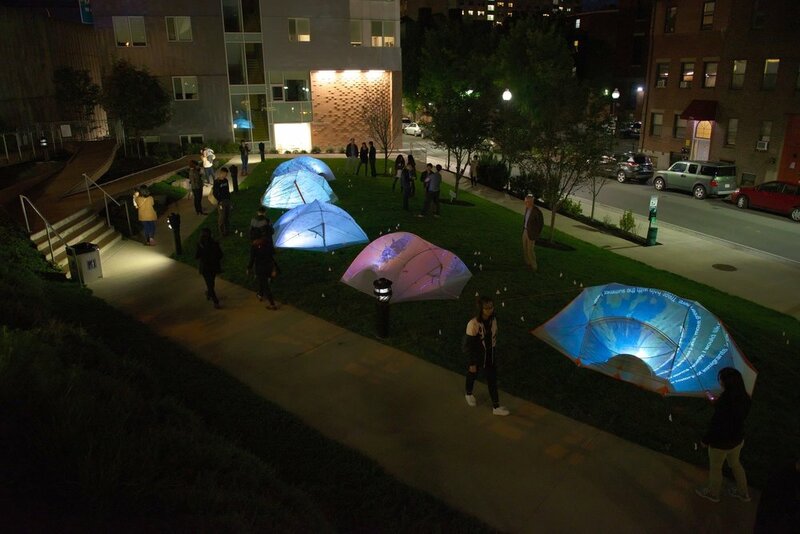 Our earliest example of this was when some residents took an abandoned parking lot, cleaned it up, and with the help of a simple projector and sheets, transformed the lot into an outdoor movie festival, free for everyone. This annual event has become our popular Films at the Gate. Our projects address the needs of the neighborhood, leveraging Chinatown's greatest strength: the people. We are committed to designing solution with community. That means we want diverse voices at the decision making table. Our work centers around housing and open spaces, which we believe are fundamental to healthy families. These are the places where families live and play. Our projects aim to advocate for more affordable housing and open spaces for all. Finally, residents are central to our work. We not only want to hear their ideas, but we want them to be at the forefront of implementing and bringing to life their dreams of what they want to see in their communities. SaturPLAY represents one of our earliest ANCHOR projects that we launched in 2016. For one Saturday a month, A-VOYCE youth activate Chinatown’s Mary Soohoo park with books, sidewalk chalk, and games for the local children. Follow our blog and our Facebook page for the next SaturPLAY and ways you can join in! ACDC youth anchor’ing down Mary Soohoo Park at SaturPLAY. I just finished a large reconstruction on my house where the entire second floor was gutted. No plaster, no ceilings, no walls, no nothing. I kept looking at the empty space, trying to re-imagine what the space could be. Should I put a closet here? A door entrance here? Could I fit a loft in the attic? My kids even asked for a small swimming pool and water slide in their room. Have you ever looked at a wide open space and imagined “Wouldn’t it be cool if…?” For one night this fall, we are transforming the open park at One Greenway (the backyard of hundreds of residents at One Greenway) into an outdoor art display, called With/out Water. Through a series of light projections, we will be telling the story of displacement and how displacement has and might in the future affect residents of Chinatown. 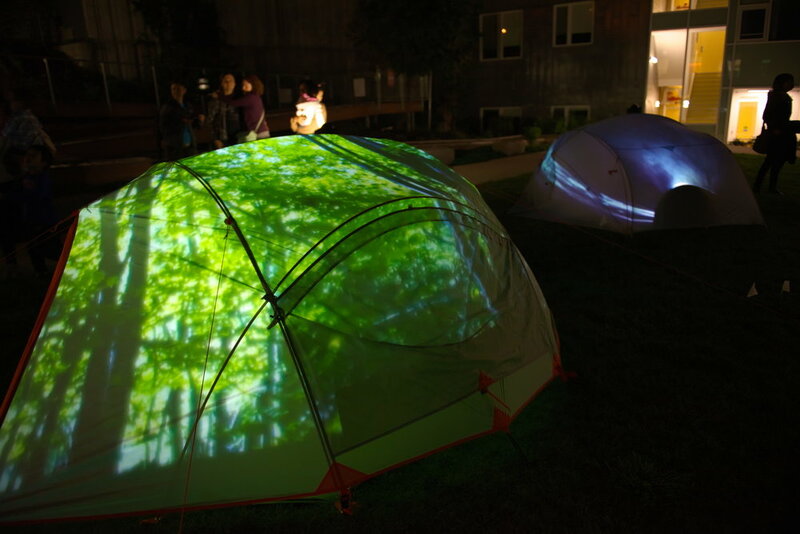 Coming September 29, ACDC has partnered with local artist Yu-Wen Wu, BCNC’s Pao Art Center and residents from our 66 Hudson affordable rental homes to create these colorful projections. The projections will turn on around 7pm after sunset. Over this past summer, ACDC residents met weekly with Yu-Wen to describe their own stories of how they moved in Chinatown. Many of them faced displacement in the past, either in their home countries, or even when they moved to America. The reasons for displacement are many, including war, natural disasters, pollution, economics, to name a few. With/out Water will focus on environmental displacement. While we often think of climate change as affecting the ozone layers in Antarctica or rising tides in Florida, Boston’s Chinatown faces the real threat of being flooded by rising oceans. Some estimates would project Chinatown to be underwater by 2050 if current environmental trends continue. Along with the outdoor projection display, we will also be opening up our community room at 66 Hudson for spectators to meet with some of the residents whose stories are told in the artwork.